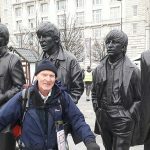 Mature Times travel writer Nigel Heath sets out on part two of his walk from Liverpool to Leeds. 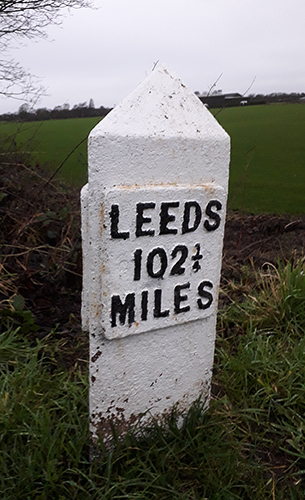 The official responsible for measuring the Leeds and Liverpool canal, Britain’s longest single man- made waterway, which took over forty years to build, and opened back in 1816, must have been obsessed with exactitude. For according to him, or her, it was exactly one hundred and twenty seven and a quarter miles long! Why, on earth, they didn’t lose that pesky quarter rather than having to include it on every mile post along the entire route I simply can’t imagine. Still it provided an amusing topic of conversation for my walking companion Peter Gibbs and I as we set off on the second stage of our walk from Liverpool to Leeds on a damp and cold January morning. We’d spent a comfortable night with B&B hosts Charlotte and Leslie Riley at their Heskin Farm in Burscough and a companionable half hour chatting with fellow guests around their breakfast table before booting up and re-joining the canal towpath nearby. A ninety minute walk brought us to the small West Lancashire village of Parbold beyond which we entered the Douglas Valley in company with the meandering River Douglas and followed it to pass under the M6 high on a massive flyover. What a contrast, a super highway of the 18th century meeting that of the 20th. Walking into Wigan, I was disappointed to see that the Wigan Pier cultural quarter opened by the Queen in 1986, had stalled due to the 2008 financial crash and that the massive Eckersley Mill complex nearby was still in an advanced state of dereliction. But it’s almost always an ill wind because the site and surrounds made a perfect setting for the hit TV drama Peaky Blinders ! A magnificent flight of locks on the edge of Wigan led the way quickly out of this busy town the following morning at the beginning of our ten mile walk to Chorley. 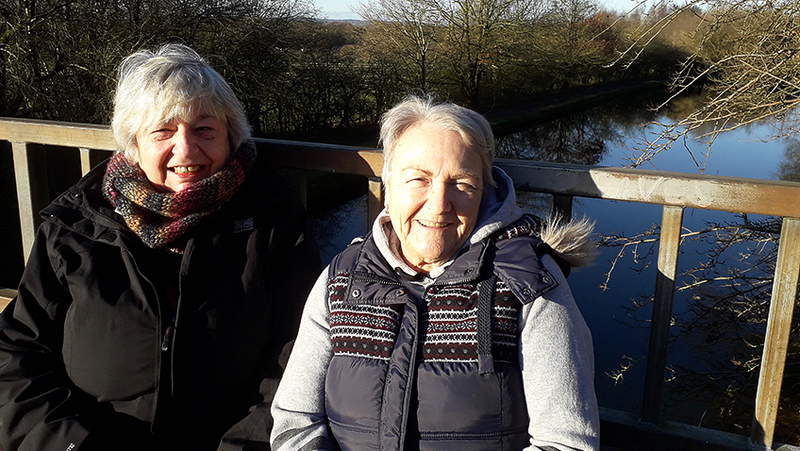 We’d not gone far before we came upon 69- year- old Janet Hughes and her lifelong friend Anne-Marie Marriott, aged 68, sitting on a bridge wall and chatting in the sunshine. They turned out to be kindred spirits in that they completed a three mile circuit, including the canal, every morning to keep themselves fit and really missed the exercise if something prevented them from doing it. Soon the long line of the West Pennine moors hove into view, an exciting prospect of more lovely scenery to come. A little further on we met friends Ann Briscoe, Barbara Snape and Doreen Jolly out reconnoitering a future walk for fellow members of the Mawdesley U3A. They’d walked the canal in sections, like we were doing, last year and had thoroughly enjoyed it. That afternoon, we were surprised to come across a red double decker bus and delighted to find that it had been converted into a canal side tea shop by Adam Pope and his business partner Lucien Berkhardt who run Ellerbeck Narrowboats at Heath Charnock. The temptation was too great to resist so we climbed aboard for mugs of tea and a Bakewell tart. Adam, a marine engineer, acquired the former Leyland bus, which had once been in service in London, drove it back to their yard and completed its conversion into a cafe last September. “I wonder what adventures we shall have today,” I said as we set out for Blackburn the following morning. It was tempting fate because forty minutes later we rounded a wide bend to find, to our dismay, that the canal had come to a dead end in a jumble of reeds, completely impeding any possible narrowboat navigation. Where on earth had we gone wrong? But thankfully help was at hand when our knock on the door of a nearby house in Whitley Wood was answered by Louise Birchall who explained that we’d simply walked right past a side lock further back along the canal. “Oh dozens of people make the same mistake and on summer weekends we can have as many as twenty very confused walkers and cyclists all going around in circles before knocking on our door and asking for directions,” she said. “You should have a donations box for the Canal and River Trust, as your reward,” Peter suggested. Luckily, all we had to do was to walk up the road to the next bridge to re-join the canal. Now we were back in some lovely open country with a hill rising on one side and a valley below us on the other. Those distinctive white and black lettered mile and a quarter markers were our constant companions and we actually came across one which been half swallowed by a tree! 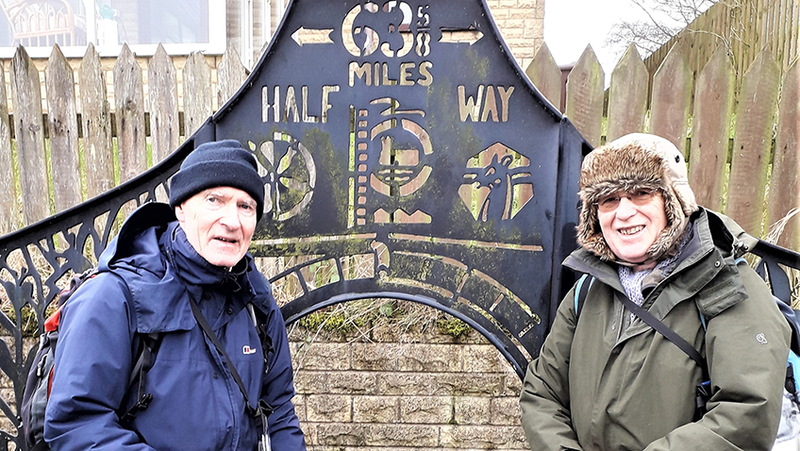 “How far have you walked?” asked a lad in a peaked cap as we trudged wearily into Blackburn. “From Chorley,” I replied. “Core I wear my shoes out just walking to the job centre,” he retorted. We passed several large red brick reminders of Blackburn’s industrial past, including one formerly used as Granada TV studios, as we walked out of the city early the following morning. We were on a bit of a mission because we needed to walk the sixteen miles into Burnley before we lost the late afternoon light. 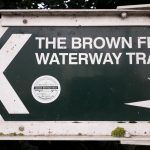 Around midday we came upon the two hundred year old ruins of coke ovens at the former Aspen Colliery in Church, known locally as The Fairy Caves, and from there it was a short step to the official half way point on the Leeds and Liverpool Canal. 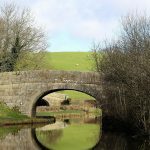 The views now opened up as the canal contoured around the rising landscape in a series of wide curves until at last we met the M65 which accompanied us to journey’s end in Chorley. We plan to return in the spring to walk the final fifty or so miles into Leeds via Skipton in the Yorkshire Dales. The Canal Companion: Leeds & Liverpool – West Yorkshire Waterways by Michael Pearson and published by Pearson and Son Ltd is a must for this walk as are the appropriate OS Landranger maps. Most fortunately, after our night’s stay in Burscough, there were comfortable Premier Inns most conveniently located not far from the canal in Wigan Town Centre, Chorley, Blackburn and Burnley.